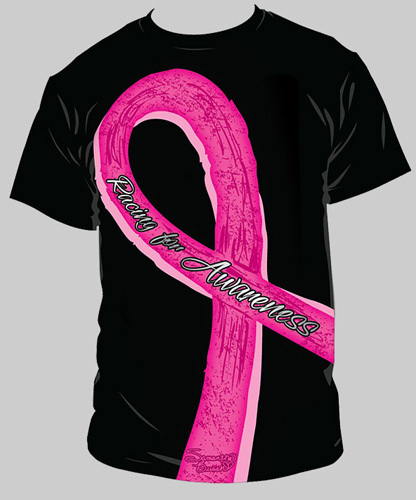 I wanted to bring a racing theme into the shirt while really highlighting the breast cancer awareness ribbon and message. I wanted the ribbon design to take on the look of a race track with rubber down on it after a race. I also thought the black shirt with the hot pink ribbon really popped! The winning design will be unveiled at the Toyota PitPass display during the October race weekend at Charlotte Motor Speedway, and it will be produced and made available for purchase. All proceeds from the sale of the winning T-shirt design will be donated to Carolina Breast Friends in the winning participant’s and driver’s names. Thank you!! Please Vote, Here is the link.